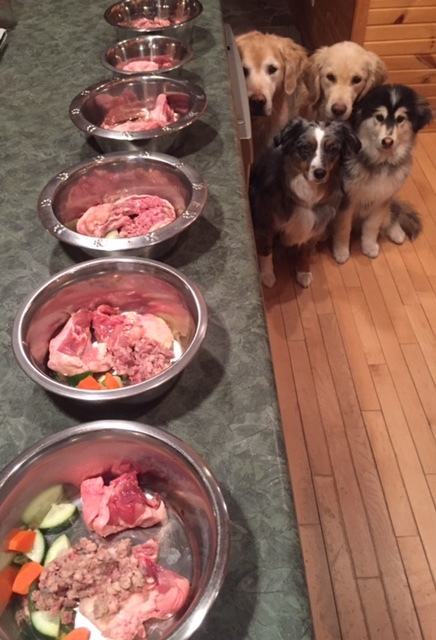 In 2011, after losing my dog to cancer, I started to take a serious look at what my dogs were eating. What an eye opening experience that was! I started to understand why Buddy had a “doggy odour”, why Maggie’s breath would clear the room and why Koda just simply refused to eat. Koda’s refusal (or insistence for better food) was the final push I needed to make the leap to raw. The research and benefits made perfect sense but I was equally as nervous as you may be feeling right now. Finally the day came, our first purchase was made and that started the journey to having happier and healthier dogs. Everything I was reading; the benefits, the simplicity to switch, and having more control of what my dogs were actually eating was all proving true. Buddy’s fur was softer, his poops were formed and had no odour! Maggie’s breath had NO odour. (I could not understand how such a pretty girl could have such bad breath! I would refrain from petting her so to not excite her and make her pant…yuck!) And our Koda was now happy to eat! There are many benefits to a Raw Fed Diet that a commercially processed diet just does not compare. Bad doggy breath will be gone! It really is fun to feed Raw! Transitioning to Raw is a very simple and seamless process. It is best suggested to make a full switch from kibble to raw. My cat is Diabetic, can he eat a Raw diet? The following is an excellent read about feline diabetes and the influence of diet. What Raw options are available for my cat? Cats are carnivores. They can NOT have any fruit or vegetables. Unlike dogs their system can not metabolize fruit and vegetables. They are 100% carnivores and require just meat, bone and organ meats to complete their diet. They also can not have any rancid meats, so tripe is not recommend for cats. Cats need a higher percent of phosphorus (meat) and a lower percent of calcium (bone) to make their diets complete. Cats can also experience constipation quicker than dogs, so keeping their diet high in meat is essential. Cats require Taurine. This mineral is essential to their diet, and if not included in their diet would be determential to their health. Taurine is naturally found in raw meats, but particularly hearts and livers. Cats are very picky eaters (generally) and are very sensitive to changes in their diet. Cats that have always eaten dry foods, typically have more difficulty switching to raw than cats that have eaten moist or canned food. Temperature is also a factor, so feeding at room temperature is recommended. Cats must eat regularly, so we do not recommend a fast of 12-24hrs (as we do with dogs). Mixing the raw into their meals although is not ideal, is a common method to transitioning cats. Cats require Omega 3 Fatty acids but these must be a fish oil (we suggest Herring oil). Omega 3’s such as flax or seed oils can not be converted or used by cats. All BCR Blends require supplementation with an Omega 3 Fatty Acid. Pure Salmon, Pure Mackerel – DO NOT contain organ meats which is essential to their diet. & Raw Food Calculator for cats!